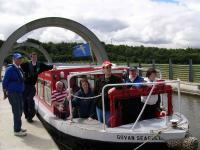 The Seagull Trust provides cruises for disabled people across Scotland. The Falkirk Branch runs two boats that hold up to 12 people, including carers which cruise the Union Canal daily, based in Bantaskine Park, near the Falkirk wheel -FK1 5PT, passengers come from the Falkirk, Stirling and Fife area and from as far north as Dundee. There is also a holiday boat. All boats have wheelchair lifts. For more information click here.